Odor Neutralizers Vaportek 3X Industrial (also referred to as Neutral): A pine and eucalyptus based formula that eliminates all organic odors. Our #1 recommended formula. Has rotating end caps. Treats areas up to 20,000 cu. ft. Always remove source of odor from area. Use 3X Cartridge for most organic odors. Use SOS Cartridge for Smoke related odors. The Heavy-Duty Standalone Cartridge is designed as a passive odor controller for use in HVAC systems and with high-velocity air dryers and air scrubbers — or wherever air can flow through the cartridge from end to end. It treats areas up to 20,000 ft3 to effectively eliminate odor contamination quickly and safely. Primarily intended for delivering a fast, high-intensity treatment, it uses Vaportek's patented spill-proof essential oil membranes to release a nontoxic, odor-neutralizing dry vapor into the air. Penetrating vapor quickly controls and eliminates malodor caused by smoke, humidity, food, and biological organic odors. Based on proven technology originally developed for use in medical facilities, the Heavy-Duty Standalone sets the standard for treating an area’s atmosphere, structure, and contents simultaneously. The Heavy-Duty Standalone Cartridge should be placed on the suction or pressure side of any air handling system. For maximum output, the unit should be laid on its long side, and the two rotating end caps opened fully to allow maximum air flow through the cartridge. As an option, a stabilizer is available with both long and short arms. Anchor stabilizer arms to the fan grill to help keep the cartridge in the desired position for optimum air direction through the cartridge. The unit may be placed in front of a high volume air dryer to provide fast and efficient odor control after carpet cleaning or flood cleanup. Deodorization may require as little as 15-60 minutes for light contamination. For more severe contamination, treatment may take several hours or days. If necessary, move the cartridge to different areas. For best results, store cartridges in a cool, dry location and keep away from extreme heat. Dry vapor output will be affected by humidity, airflow, and temperature. Ideal dry vapor release occurs at 50-80°F. Vapor release significantly increases in excess of 90°F. The Heavy-Duty Standalone Cartridge provides immediate and powerful odor control in areas where most systems cannot. The dry vapor deodorizer quickly permeates all porous surfaces it contacts. Odor-contaminated surfaces can be reclaimed using the Vaportek odor control system to eliminate imbedded odors. It requires no noisy fogging apparatus or evacuation of treatment areas, as with ozone machines, and it does not require electricity. The cartridge is available in the 3X Industrial formulation for all types of organic odors, and in the S.O.S. (Smoke Odor Solution) formula, designed specifically for treating all types of smoke odors. Not designed for continuous, long-term operation. Cartridge life is approximately 270 hours. The system does not create moisture or ozone, and will not harm fabric, plants, rubber, adhesives, electrical components, or remove pigment from leather. 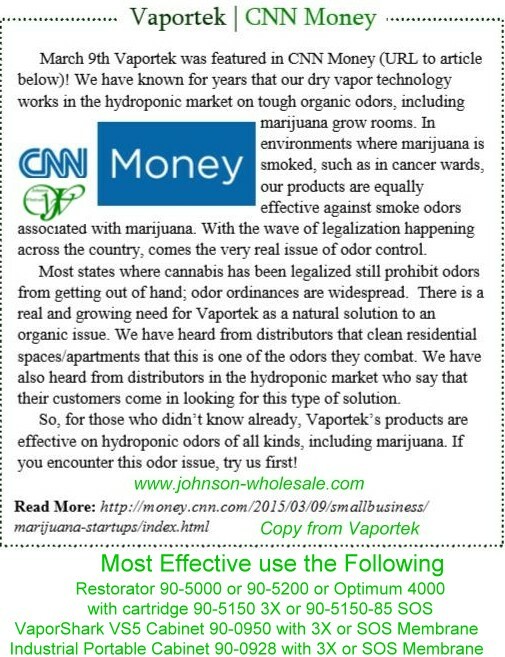 Vaportek products use natural essential oils. If an allergic reaction occurs, please discontinue use immediately. Dimensions: 5.75"H x 3.75"D. Weight: 1 lb.